Once you’ve decided to be part of an Italian greyhound’s life, you will be dragged into several circumstances and your life won’t be the same anymore. This little elf has so special gifts that will absolutely bewitch you. It’s not a coincidence that this “little animal” has charmed even the hardest hearts of famous kings and queens, and captured the hearts of “not dog-lovers”. 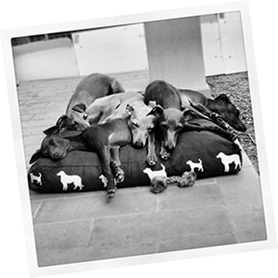 This is one of the reasons cause the little greyhound has always gained places of honor in the most aristocratic residences. Also in my house (not aristocratic) they have gained all the comforts. The nature has selected the most harmonious shapes, the most expressive eyes, the most silken coat, the most aerodynamic lines, the strongest and springiest mussels, and everything in a unique little jewel of only 5 Kg. 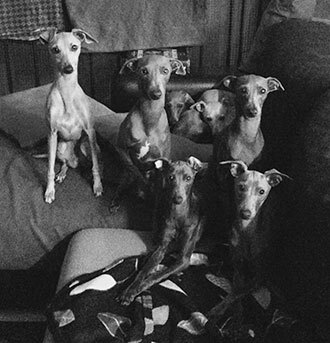 It’s not the physical perfection, the italian greyhound’s strength, but his continual and authentic capacity of giving and create love, and also his intelligence and his joyful liveliness that characterize him. He is a perfect life company, able to adapt himself quietly and joyfully to the life of his human family, following it everywhere without asking anything in return, just the sweet company and to be deeply and truly loved back.